Since 2007, Hamas has controlled Gaza, and Fatah has controlled the West Bank. Now, they're trying to work out their differences. Two Palestinian rival factions, Hamas and Fatah, just signed a reconciliation agreement Thursday aimed at reuniting the two Palestinian territories. Hamas has controlled Gaza since 2007, while the Palestinian Authority has controlled the West Bank. This agreement would attempt to bring the two territories back under the control of a unity government. But Hamas and Fatah have been here before. In 2014, the two groups managed to form a government. It didn't last long, though, partly because Hamas never really surrendered control of Gaza. Other obstacles lie in the way of this reconciliation agreement. 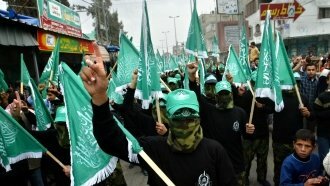 The two sides have reportedly not talked about what happens to Hamas' militia or the group's network of tunnels under Gaza. And Israel might also stand in the way of reconciliation. The country's prime minister, Benjamin Netanyahu, said Israel will oppose any deal that doesn't require Hamas to disarm. There is hope, though. This deal is backed by a number of powerful countries, and experts think Hamas' growing isolation might keep them in the deal.